BookHounds: Pick your favorite photo! Win stuff! Pick your favorite photo! Win stuff! My brother needs some help in picking the best photo of the car above. Please help him out and let him know your thoughts. Comments are appreciated. I have a bunch of bookmarks and things from BEA - so leave your email or twitter address in the comments and I will pick a winner for this stuff. Maybe two or three. The reflection of the dead leaves in the bumper in the first is distracting. Although... it depends on what he's after. It's an arty touch and that might be the better choice. i'd prefer 2nd photo, much cooler feeling in there than the first one. I like better the first one, if it's about the car. It's all so bright and red, and you can see the details better. Like, I'ld buy that car if it was that bright red. they're equally awesome, for different reasons. I voted for the bright one, because you can see the color of the car better. I voted for the first one. I think the colors come out better. I like the 2nd picture. I like the way the clouds reflect off the cars exterior. The first one is a bit too bright for me. They're both beautiful but the second one says something while the first one is just a "pretty car picture". Definitely #2. Love the sky and clouds. I like the red. It makes the car stand out. I think the blue makes it blend in with the sky. The first one is gorgeous. It's very vibrant and the colors all pop. It stands out while the second photo is very subdued. I can't stop staring at that first picture. I find the reflections in the bumper too distracting in the first photo. Is it leaves or gravel? The blue sky photo is sharper, crisper. It shows the dimensional image of the car better. Makes me wonder how the gravel/leaves would look instead of concrete? And maybe redder on the car, like the first image. I voted for the red car with clouds because I just felt the colors were just too loud if that makes sense? I do like both of them, and they are both awesome photos (and a wicked car), but the blue one just seems more peaceful...Like relaxing on a nice summer's day. The red car with trees is more like an "I'm gonna go party" type thing. I voted for the red car with trees. It just caught my eye best. I loved the red car one because of the landscape in the picture. Loved them both but it depends on what he's after. If it's for a contest what kind of contest. Both are striking though in different ways. I really like the first one better. The colors and car pop more in that one than with the 2nd one. Maybe had it been a bright red car with the cloud background I would have picked that one. I like the red in the first pic better. the car itself looks better. I like photo number one the best. The attention to detail is great, especially the ground/gravel being reflected in the rear bumper of the car. Please relay to your brother that the reflection of another car in the sky (blue#2) photo might be distracting for it's use. 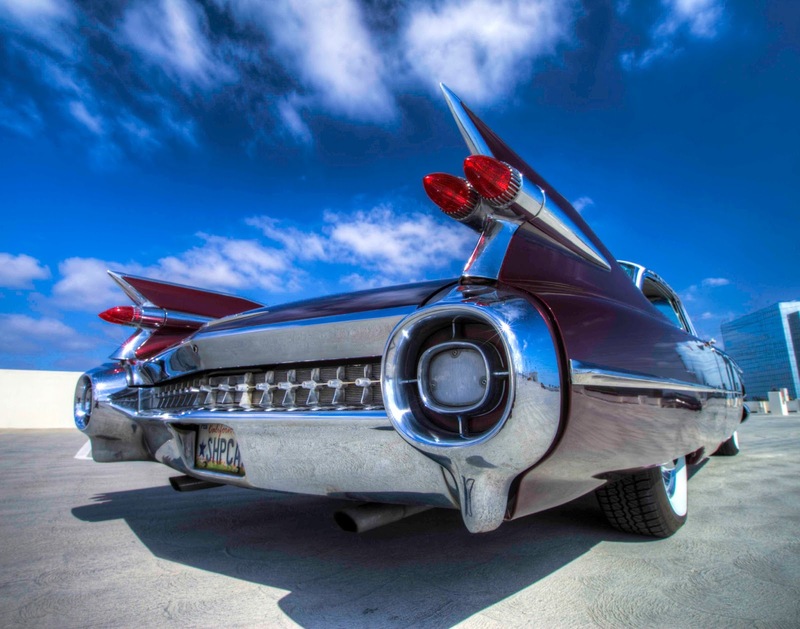 This is my dream car - 59 Cadillac (only the one pictured is a hardtop and I would love a convertible) - the largest fins ever made, a beautiful car. 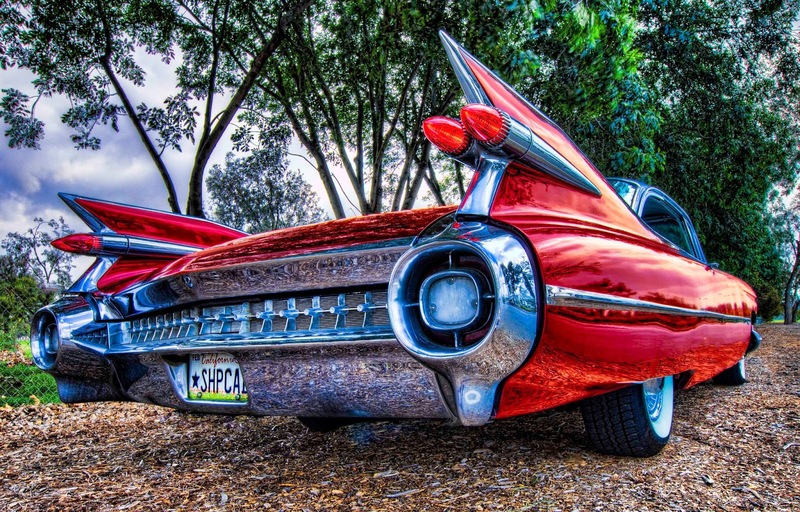 Take me back to the 1960'w with the bright red car with the trees and I'll be a teenager again going for an illicit ride with "that" boy who lived and rode wild and free! #2 is my favorite. I love the fact that the car seems in motion. I like the second picture a lot! I like the first one. The red against the trees really stands out. It's more vibrant for me and I can see the details of the car better. I love the picture with the clouds. I liked the trees, although I don't know why except it struck me as prettier. First of all -- omg what a GORGEOUS car!! Second, I like the first one better, as I think it's a slightly better angle where you see more of the right-hand side of the car. Also, THAT COLOR. Gorgeous! To be honest it looks like a different car in #2 without being able to see the beautiful red paint job! I do agree, however, with another commenter that it could depend on what he wants to use it for. I voted for the pic with the clouds although I really liked the composition of both. I like the bottom one with the clouds. The top one did catch my eye but it has too much going on. I voted for the second one. The first pic is too busy for me. The second pic gives it a futuristic look. Kinda cool considering it is a retro. I like the second one because the background makes the car look like it is traveling at a very fast speed. the background of the first pic looks impossible to drive really fast, but that is just my POV. I think the car gets a bit lost in the second one so I voted for the first. The red car really pops and I love the trees as a backround! Oh I really like them both. But I'd go with number one. I love the vivid color of the car. I picked car #1 because you can concentrate on the car. The car blends into the background more in #2.